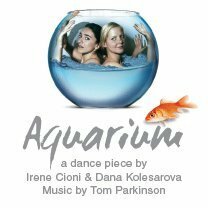 A duet with dancers Dana Kolesarova and Irene Cioni. An ongoing project, originally started in summer 2008 at Newington Dance Space. Like fish we gravitate towards nooks and crannies, we constrain ourselves. We enjoy unlimited freedom, but when we have it, then what? Gravity, distorted images, the distance, the proximity…. illusions. A twenty minute long dance work investigating themes of constriction and freedom, attachment and distance, equilibrium and gravity and unlimited freedom. At times flippant and other times poignant the piece invites the audience to witness the frustration of constraint and it’s relationship within the feeling of being free. During the process we presented different versions of our work sometimes as a site specific installation; or work in progress; but ultimately it has been devised for the stage.